Prior to joining the Hand, Budo was a general in the United States Marine Corps. Kenkoy is selected to run a special project from the D.O.D. (Department of Defense). The goal of the project is to create a special virus uses the telepathic means. A group of telepathic subjects is selected and brought in among them Eddie Passim and Theresa Bellweather. Kenkoy takes Theresa Bellweather kills her and harvests her brain tissue to create the About Face virus. He then plans to do a large test of it, by using Passim as a telepathic trigger. However, Passim and the other subjects manage to destroy nearly all of About Face. Only one vial survives it rolls and is lodged in subway tracks. Only Eddie Passim knows where that final vial is. Kenkoy then killed all of the subjects and only Passim escaped. Passim went on to live in the streets as a homeless man for years. Bodu is a character in the Daredevil story known as Fall from Grace. In this story he battles Daredevil with the Hand searching for a special telepathic virus known as About Face. He follows the orders from Lord Daito. In doing so he faces off various heroes that includes Daredevil, Elektra, Shang Chi. Overtime Kenkoy continued to do illicit deals, eventually he was caught and court marshaled. He became a drug dealer. He began to hatch a new plan to create the ultimate street drug by using the last remaining vial of the About Virus. Needing allies he sought out the Hand. The Hand thought the old American convict was crazy when he came before them. Dismissing him they attempted to kill him. However, Kenkoy killed one of the Hand and immediately impressed Lord Daito. They brought him into the fold of Snakeroot clan elite portion of the group and gave him the new name of Budo. One of his agents is found and killed by Venom. This leads Venom to also pursue the About Face virus. 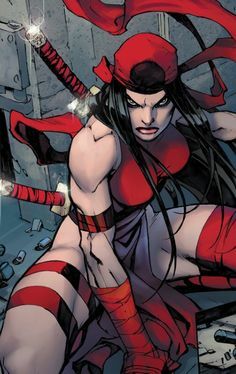 Budo helped create a dark essence of Elektra into a new body called Erynys. He then found Passim and helped the other Snakeroot Clan members torture him. The group finally finds the vial. With the vial in hand Budo decides its time to kill the last remaining witness to the About Face project. Before Budo can finish his murderous attempt he is hit by a telepathic blast by Eddie and is killed. Finally, after his life had been destroyed and friends killed Eddie finally gets his vengeance.